Are you confident about your roofer? 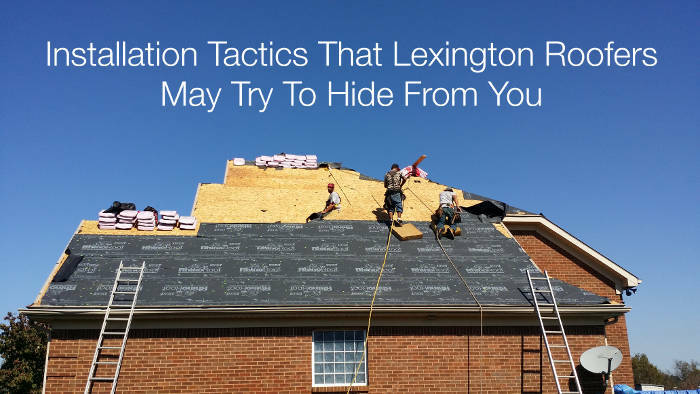 Let’s look at a few installation tactics that roofers in Lexington, KY may try to hide from you. Before we begin, let us all factor in that there are many great roofing companies who provide excellent service and terrific workmanship. Now, for the few that may not care about their commitment to quality, here’s what you may want to confirm before you place your trust in them to install your roof. When you have your roof replaced, the obvious probably rings true, you’ll have to have your old shingles removed. But there’s more to a quality replacement than just simply replacing the outer layer that you can see. Let’s cover what should be replaced and removed. This goes without saying. Your shingles will be one of many components that get removed and replaced. Roofing underlayment is a material that acts as an additional barrier between your wood decking and the shingles. If your roof hasn’t been replaced within the last few years then you’ll likely have an older type of underlayment called asphalt roofing felt. 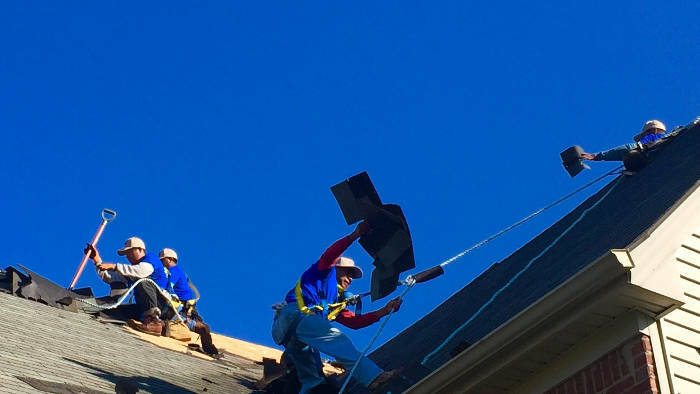 One common practice during a roof replacement is where the roofer may decide not to remove the old roofing felt or at least not fully and completely remove it. In many cases, during the process of removing the old shingles, by default some of the old layer of roofing felt will be removed. Once all of the old shingles have been removed the original layer or partial pieces of the roofing felt might still remain. As you can see, all of the old shingles have been removed, but some of the old roofing felt still exists. 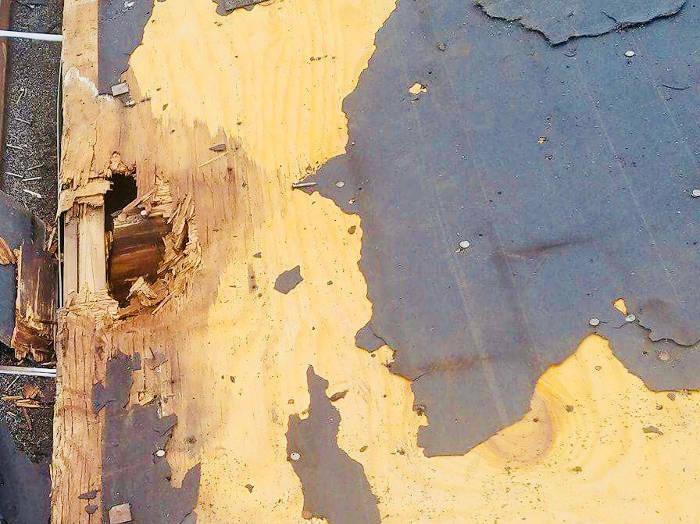 If you’re roofer doesn’t invest the time in completely removing the old felt then they won’t be able to identify any possible damage that may exist on your wood decking. This is one tactic that a roofer may try to prevent you from being aware of. Spending the extra time necessary to completely remove all pre-existing felt costs money and reduces profit margins for any roofer. 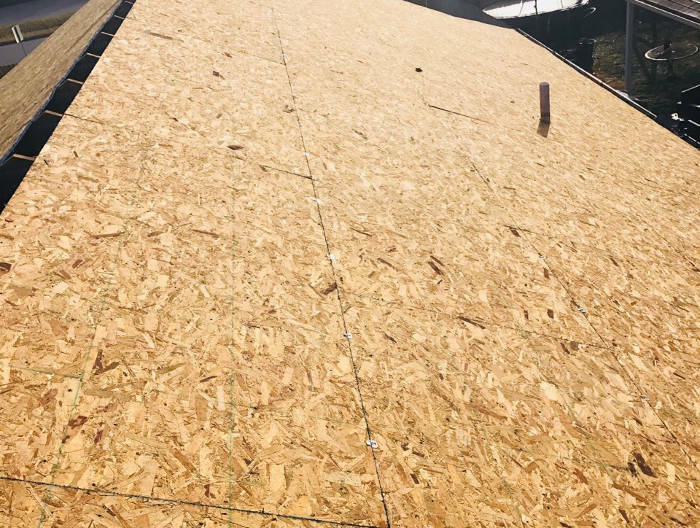 However, if the roofer cares about the quality of your installation, then they should be more than willing to ensure your surface is fully prepped and all components, such as the wood decking, are in perfect condition prior to continuing the installation. Here’s one of our projects where we properly prepped the surface prior to beginning the installation. Most roof repair and replacements are generally performed by a contractor based on a hard quote (fixed estimate). A material that can often get overlooked in the estimate is the wood decking. 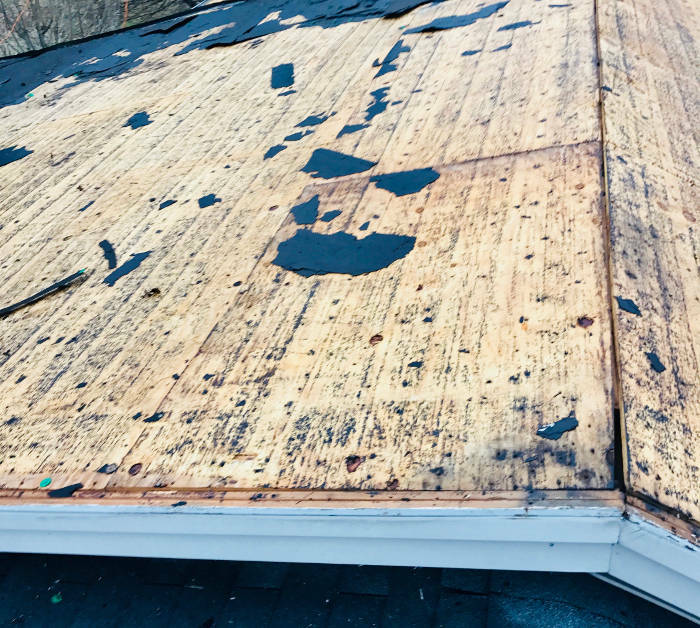 If the roofer doesn’t factor in all possible scenarios in their estimate, such as forgetting to include an additional required investment for replacing any rotten or damaged wood decking that they find, then they might be likely to avoid bringing this to your attention and just install the materials over it. Here’s what rotted wood decking looks like. Not all wood decking that requires replacement may be as severely damaged as above. So, make sure your roofer knows that you want all damaged or rotten wood decking to be replaced, even if it comes at an additional expense. If you assume that by hiring a roofing company to replace your roof it guarantees they’ll do it correctly, think again. Unfortunately, not all roofing installations are created equal. While materials such as felt and shingles may be standard across the board for an installation, many other materials can and often get left out. Whether it’s intentional or due to the roofer not being educated on best practices, here are the materials you’ll want to confirm that they must install. Here’s an image from Owens Corning that illustrates some of these components. One of the last and ultimately most important tactics to be aware of are the installation requirements that pertain to the manufacturer’s warranty. Manufacturers such as Owens Corning and CertainTeed, who manufacture shingles and other roofing materials, both have installation requirements that must be met adequately in order for them to honor your roofing warranty. If your roofer doesn’t adhere to these installation methods that are required, then your warranty may not be fulfilled to its entirety. So, how do you know that your roofer is implementing installation procedures that honor the warranty? One simple step is to ask for ongoing photo documentation. As with all of our installations, we have an on-site quality control manager who oversees your project. We employ this position as a sole purpose for assuring a quality installation, to keep you informed on your project’s status as well as to provide answers to your questions. Here’s an example of the communication you should and can expect if you hire us to perform the install. We understand that as a homeowner, you want the very best for your home. We also value and appreciate the time you’ll take to place careful consideration on which contractor you hire to install your roof. When it comes to quality and respect for your home, you can rest assured that Lexington Blue takes great pride in delivering the quality and respect that both, you and your home deserve. We ensure that our installations are performed with methods that adhere to your warranty requirements as well as procedures that meet our own set of quality standards. When you’re ready to have your roof replaced by a contractor who only implements quality tactics, trust Lexington Blue.